UPDATE: I improved the transparency, the animations, the outlines and basically made them better looking cursors, I think. I also changed the screenshot. I wanted to make something to go with Windows Vista look. These were made with the glass transparent look and I'm working on a set to go with the darker theme. I hope you like them! Update: I just updated the name. It was a little late when I uploaded. The name was supposed to be Vista Plastic and not Luna Plastic. Believe it or not, I actually liked the working state of the old one better. Not that I do not like this one. I think both versions are fantastic. Can they be released as two seperate versions? Luckily I had the older version saved. I just called it x2 appended to the original name. Beatiful work BTW. I'm a Graphic Designer and I LOVE being able to see THROUGH this cursor. If you have time, can you make a darker version of this Cursor? FINALLY!!!!!!!!! 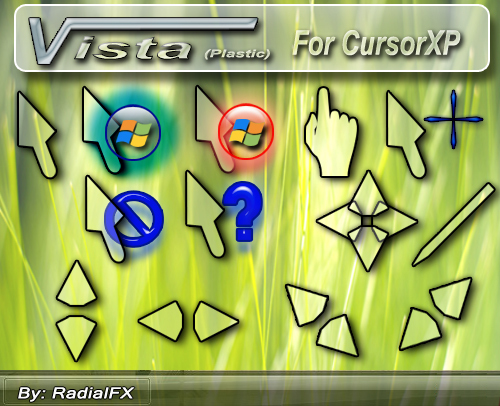 The perfect cursor..............precise, functional, simple and adult. Especially love the flashing windows logo when waiting. Thank you for my default cursor!